Refreshing mask infused with marine collagen, lifts and hydrates in just 5 minutes. Softens the appearance of wrinkles on forehead, around the eyes and chin. Over time, improves skin health and strength. No fragrance, biodegradable paper mask can be used daily. 26 Masks in their own storage container, comes with English usage instructions and ingredients. Collagen is the main supporting fiber in the dermis, responsible for giving our skin its strength and elasticity. Though lost collagen cannot be replaced from the surface, it does provide excellent hydration. Each moist sheet has cutouts for eyes, nose and mouth. The soft mask conforms to the shape of your face, hugging the key areas around the eyes, nose and mouth. Recommended for dry, mature, sun damaged or wrinkled skin. 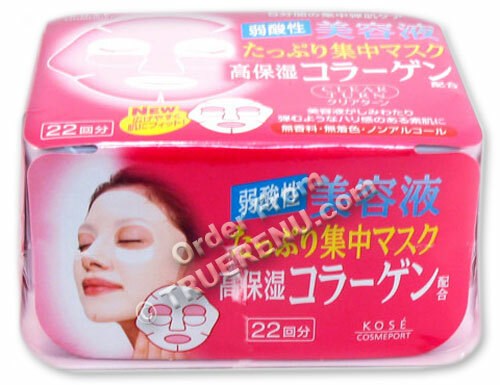 We like the facial masks pads from Japan, not only for their convenience, but for their simplicity. They can hold all manner of rich nutrients, and allow your skin to drink them in at leisure. TrueRenu does the searching - and researching - for you. We look for hard to find, hard working products that do what they promise, and we bring them to you with detailed descriptions. Your satisfaction is guaranteed! Carefully remove and open one mask to its full size. Lay over your face, apply slight pressure to the mask around eyes and mouth, then gently push all the air out from mask and face. To treat under eyes, be sure to make contact between the eye cutout area and the skin. Leave the mask untouched for at least 5 minutes, then remove and discard. Remove or massage residue into skin. Follow with normal special care routine, lotion, and makeup. Use 2-3 times a week, or daily in place of toner. Remove contact lenses before use. Ingredients: Water, butylene glycol, glycerin, dipropylene glycol, PEG-8, sodium hyaluronate, laminaria japonica (brown seaweed) extract, PEG-50, hydrogenated castor oil isostearate, citric acid, sodium citrate, triethyl heaxanoine, methylparaben. Shiseido's new luxuriously rich conditioner with a fresh aroma penetrates damaged hair with camellia oil's own amino acids. For true improvement in sheen, volume, texture and manageability outside of a salon, look no further!